Tacky the Penguin was published in print in 1990. 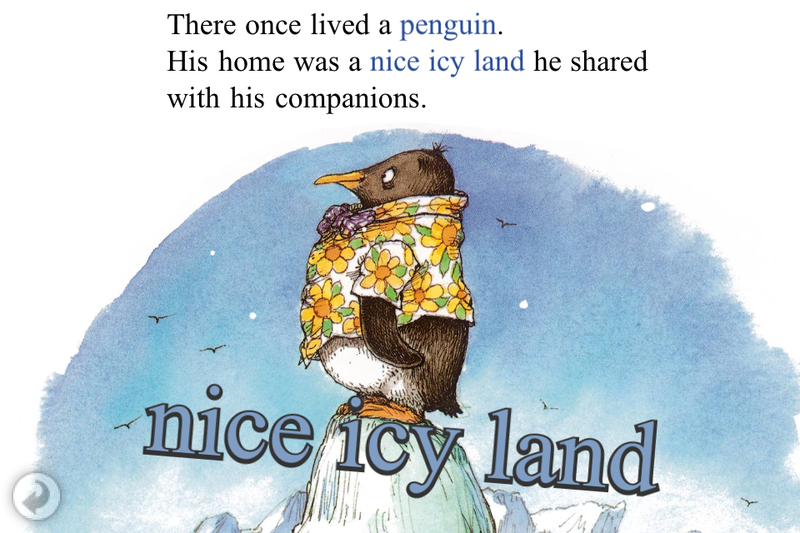 It is a beloved story about a penguin who is not quite like the others. Tacky is 'an odd bird' according to the story, because he dresses and acts differently than his companions. They are proper and formal, right down to their bow ties, but Tacky dresses in loud shirts (befitting his name), belly flops into the ocean and does all sorts of uncouth things. This non-conformism comes in handy, though, when a band of hunters comes to capture penguins to sell as pretty pets. Tacky convinces them that these aren't penguins at all, given that Tacky is so different from the animal that 'marches neatly in a row, dives gracefully and sings pretty songs'. Ultimately Tacky's horrible singing drives the hunters away. This quick thinking by the oddball penguin shows that being different can be not only okay, but a gift. This story, by Helen Lester, is beloved in print, with an overwhelming number of 5 star reviews on Amazon.com. The digital version is no exception, only adding to the otherwise delightful story. The book is interactive, engaging and well-narrated (right down to the truly awful singing). It also enhances early reading skills, with narration that highlights as it is read and images that name themselves when tapped. For example, touch Tacky's shirt and the word "shirt" appears on screen while it is spoken aloud by the narrator. Overall, this is a top-notch digital picture book. It has a wonderful story that is uplifting and engaging with lots of great features. It is also a great book for teaching about appreciating difference. Tacky the penguin is not like the other penguins. He doesn't march in a straight line, dive gracefully or sing like an angel. Then one day a band of hunters comes to trap the penguins to sell for their elegant reputation. In a moment of quick thinking, Tacky convinces the hunters that these aren't penguins at all. He shows them his terrible marching, belly-flop-style diving and painful-to-listen-to singing. Soon the hunters have left the flock in peace.